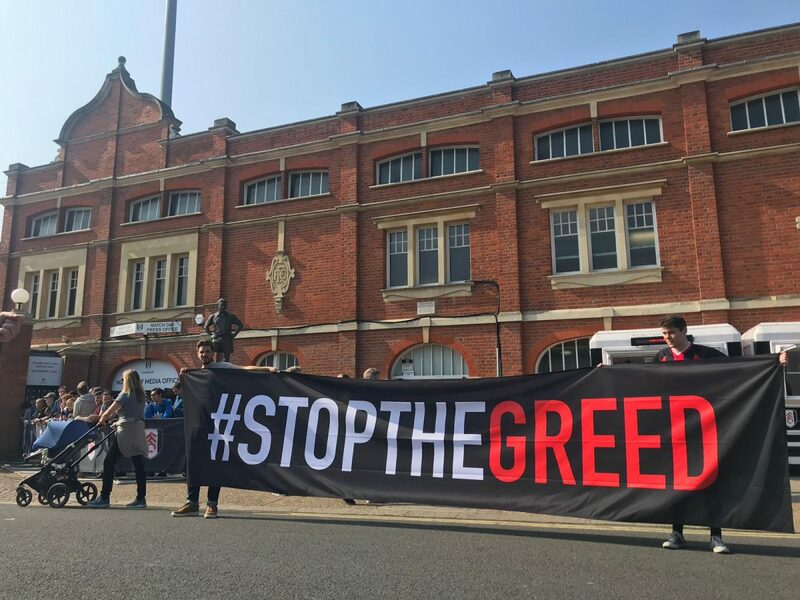 Fulham has always been a family club – affordable tickets will help keep it that way. Drew Heatley looks back on our #StopTheGreed campaign. Fulham 4-0 Barnet. 25 February 1995. Endsleigh League Division 3. I knew I liked football before this game (I went to training down the local rec etc), but I didn’t have a team. That changed on this day – my eighth birthday. I stood on the terrace of the Hammersmith End with my Dad, kitted out in a replica shirt, hat and scarf, and – alongside 6,193 others – watched as we ran roughshod over the “other” Bees. It was a big moment for my Dad, who waited until I was old enough to enjoy the game and not be a hindrance for 90 minutes. And it worked – I was hooked. 24 years later and I find myself two months away from becoming a father. And, naturally, I’m already looking years ahead to when I’ll take my son to his first game at the Cottage. It’s made my involvement with the #StopTheGreed campaign even more poignant – and the message it’s sending even more important in my eyes. I’m desperate to keep this club in my family. Was it the perfect protest? Of course not. None of us have ever tried anything like this on any kind of scale. But coverage from Sky Sports, several national newspapers including the i Paper and the Daily Mail, and outlets like ESPN, ensured our message was heard loud and clear. And we know that it’s been discussed at the very highest levels of our football club. But we’re not naive – the proof is in the pudding; if and when we return to the Premier League, the club can’t make the same pricing mistakes. If you’re reading this or you listen to the pod, the chances are you’re aware of the campaign and our thoughts behind launching it. So I won’t go into it again. But the point on season tickets is important to draw out one more time. Having a season ticket doesn’t make you more of a fan than anyone else (insert clapping emojis throughout). There are so many reasons why Fulham fans don’t have them – having kids being just one. Those who peddle the “just buy a season ticket” argument may find themselves in that position in the future. And let’s not forget that season tickets certainly aren’t exempt from price hikes. This is everyone’s problem. This is everyone’s fight. It’s been a hell of a rough season. Tempers are frayed and patience is at a premium. As such, it’s easy to conflate this campaign with criticism of the Khans. To be clear: this isn’t, and it never has been. We’re all appreciative of the investment Shahid Khan’s made in the club since his arrival. This isn’t even about Tony Khan (don’t mistake a 54th-minute hijack for anything other than that). This is about safeguarding the future of our fan base. Time will tell whether it worked or not. But for now – thanks to everyone who came out and helped hand out flyers. To everyone who chanted on 55 minutes. Who shared the hashtag online or supported the campaign in any way, shape or form. Thank you. We have to make sure watching Fulham is affordable for all fans. For us, but more importantly, for our kids. So we can continue to hand down this gift (or curse, depending on your disposition!). Talkin’ ‘bout my generation? Well, no – we’re not, actually.